We can add the Yankees’ Alex Rodriguez to the ever-growing list of celebrities who do NOT take our advice. More than a year ago we suggested that he come clean about the steroids, and today The Miami Herald reports that, while he did admit to taking banned substances from 2010 to 2012, he didn’t tell the public — just the DEA. So we’ll never think of Vitamin Water the same way again, either. The deal A-Rod signed means that he’s immune from prosecution as long as he tells the full truth and testifies against the company that gave him those delicious gummies. 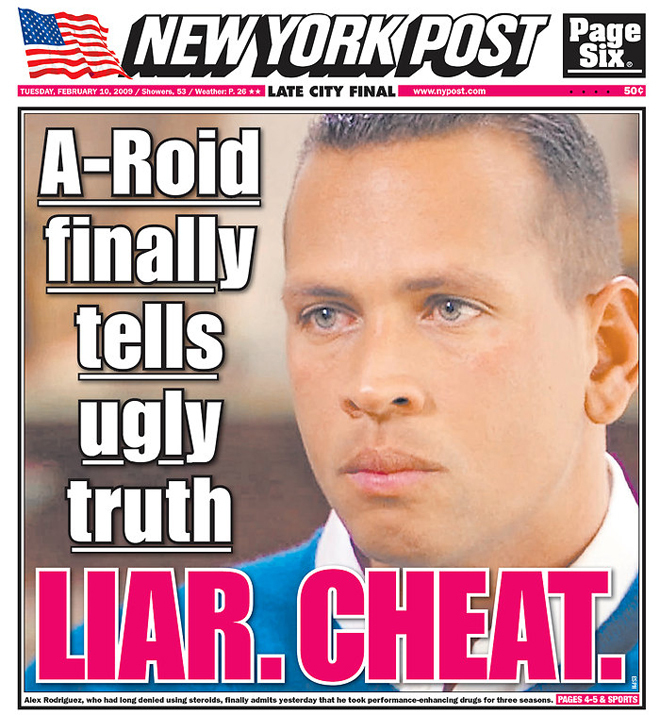 The funniest thing about this story is the fact that A-Rod told the public that “…I did not use performance-enhancing substances” and promised to take his case to court two weeks before admitting to authorities that it was all a lie. Will he ever play baseball again? The Yankees officially ended his suspension after the World Series, and they do still owe him more than $60 million dollars. But given the fact that The New York Post now calls him “A-Rat” and Photoshops tiaras onto his head, we think it safe to say that his reputation has been thoroughly ruined.